The Grauer School has a wide variety of student support programs for learners who need extra support and can benefit from close mentoring and monitoring. As the worldwide leader in the small schools movement, we are dedicated to providing comprehensive, personalized student support programs to our student body, as well as accompanying services to students throughout San Diego. Our student support programs to address the unique challenges each learner might face during his or her journey through the middle and high school years. To learn more about our enriched education support services, including which student support programs are offered exclusively for Grauer students, as well as those available to students from other schools throughout the San Diego area, please continue reading. This unique program is available to all students at The Grauer School who desire private mentoring and/or educational and organizational assistance. This is open to full-time Grauer School students ONLY, and enrollment is limited. The mentoring program is specially designed to meet a student’s needs and typically focuses on organization, study skills, and educational gaps. With that said, equally important social, homework, and tutoring issues may be addressed. The emphasis is based on family requests, teacher recommendations and standardized test scores. Mentoring placement is one-on-one pending mentor availability and student schedule. “Ed Mentoring” sessions are scheduled during a student’s “free” period during the school day. Availability for after-school mentoring is limited. Immediately after school, students come to the Learning Lab and a teacher personally checks their homework book for completeness. Monday–Friday, 3:00 pm to 3:15 pm. This after-school study hall provides a supervised space where students can complete homework with a teacher on-hand who can answer homework questions and check homework books for completeness. The program is offered Monday through Thursday from 3:10 pm to 5:00 pm. A faculty member teaches your child individually (see the Independent Studies page). The Socratic Seminar Program offers half-size classes (three to six students) with enriched curriculum and/or self-paced study in a small, supportive group setting. 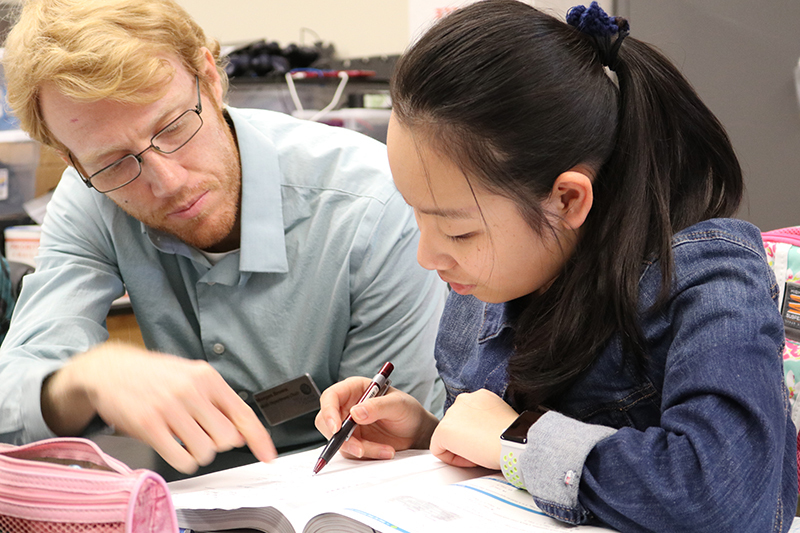 The Grauer School offers after-school tutoring sessions in specific subject areas and SAT review. This service is available to non-Grauer School students as well. Notification of cancellation must be received at least 24 hours in advance with an acceptable and legitimate excuse, or will be subject to full charge (prices subject to change). To enroll, please download and fill out the Enrollment Application, and bring it to Grauer's office. For further information about any of the Student Support programs, please contact Clayton Payne at claytonpayne@grauerschool.com. Click here to download the Enrollment Application. The Grauer School in Encinitas continues raising the bar of academic excellence and social leadership for other private schools in Southern California to follow. Our six-acre, green campus is home to some of the most independent, critical thinkers and socially-conscious agents for change in the world today.